Home featured health Is your ‘healthy’ snack really healthy? DONE right, snacking can help you avoid energy slumps, fill nutritional gaps in your diet and keep your appetite in check. But it’s all too easy to be fooled into thinking seemingly healthy snacks are good for your waistline. To make snacking a success, steer clear of these not-so-healthy offenders. So light, yet crispy, rice crackers and cakes are the ultimate diet snack food cliche. They lack fibre and can have a high glycaemic index (GI). They have the kind of carbohydrate that will send the hormone insulin into overdrive, promoting fat storage in the body. Rice snacks aren’t particularly filling either, meaning you’re unlikely to feel satisfied just eating one or two. Some flavoured varieties also have added salt and artificial ingredients. When combined with a high-protein option, such as cheese, nut butters or hummus, rice snacks are a nice treat to be enjoyed in moderation. On their own, there’s hardly any bang for your nutrition buck. 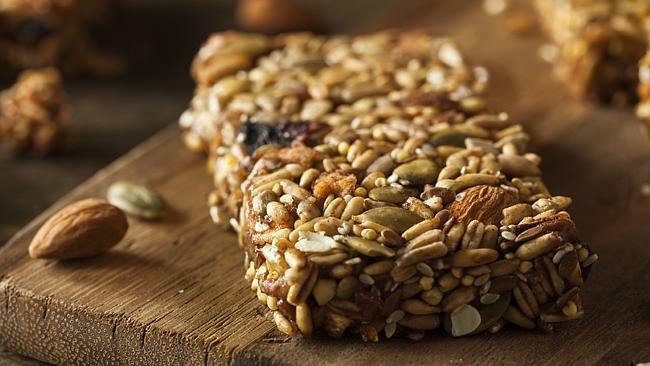 Most nutritionists will advise you to snack on a combination of carbs, protein, and fibre for sustained energy — and a trail mix seems to fit the bill. However, many mixes throw in not-so-nutritious add-ons, like yoghurt-drops, chocolate chips, excess salt, vegetable oils, preservatives and added sugars. What’s more, the chances of demolishing an entire bag at once is highly likely, meaning a 100g serving may contain as many kilojoules as a small meal. Provided the nuts are unsalted and the fruit is unsweetened, stick to a 30g serving (a small handful) at a time. This on-the-go alternative to a morning breakfast or afternoon pick-me-up is often nothing more than a carb-dense sugar bomb that offers very little in terms of sustainable energy or hunger-busting protein. Many may also include misleading claims like “whole grain” or “low fat”, but when you actually look at the ingredients, you’ll find refined grains (maize starch and modified starches) glued together with added oils, additives, fillers and added sugars (honey, fruit juice concentrate, glucose syrup, rice malt syrup), creating a calorie-punch akin to a chocolate bar. If you’re going to eat them, pick ones with fewer than 800 kilojoules and 20g of total carbohydrates per serving, and choose bars with as few ingredients as possible. Sure, smoothies can be an efficient way to consume much needed fruits and veggies, but when you combine a long list of other healthy ingredients, like yoghurt, chia seeds, muesli, cocoa, honey and protein powders (the list may go on), it can equal a calorie overload rather than a quick healthy drink on the run. What’s more, some store-bought varieties can include “hidden sugars” found in fruit juice concentrates, frozen yoghurt and sweetened juice, rather than whole fruit, adding up to 30 teaspoons of sugars and close to 2000 kilojoules per regular serve — about the same as a full meal. Your most economical and healthy bet is to stick to three key ingredients, for example fresh/frozen fruit, yoghurt/milk and flaxseed. Choose the smallest serving size and, if you’re buying ready-made, remember to read the label carefully. Sure, most of the fat has been removed, but to compensate for the full-bodied flavour and mouth-feel that fat provides, many low-fat flavoured yoghurts are stuffed with sugar resulting in the same number of kilojoules (if not more) than their full-fat equivalents. “Diet” varieties are no better. Even though they’re sugar free, they contain artificial sweeteners and a heap of other ingredients like thickeners, starches or gums. Your best bet. Opt for the natural, unsweetened varieties and top it with some fresh fruit, a dash of cinnamon for well-rounded snack.